KONG IQ just signed an agreement with Missouri Western State University (MWSU), making MWSU the first NCAA Division II Athletic Department in the country to move towards a single database for sports medicine & sports performance. KONGiQ, powered by Vivature, sets a new standard when it comes to measuring athletic performance data, as the only strength and conditioning software that tracks velocity, force, distance,and effort; using a three-dimensional robotic tilt-camera and a large-scale enterprise-level software. KONG IQ allows your strength & conditioning staff the ability to work in conjunction with other departments to improve the overall well-being of each student-athlete. KONGiQ was developed by Vivature and is in the same database that records student-athlete activities in Nutrition, Behavioral Health, Academic Counseling, Athletic Training and now Strength & Conditioning. This is the first software in America that integrates the student-athlete life-cycle into one platform. KONG IQ sets a new standard when it comes to measuring athletic performance data. As the only strength and conditioning software program that measures strength performance with 3D Robotic-Tilt Cameras, KONG IQ lets your strength & conditioning program offer something no other can—all while making the data collection process easier for your staff no matter the sport. Established in 1915, Missouri Western State University is located in St. Joseph, Missouri and has not only been the summer training camp for Kansas City Chiefs since 2010, but also proud home to the Griffons. They field 16 Intercollegiate sports teams that compete at the NCAA ll level in the Mid-America Intercollegiate Athletics Association (MIAA). 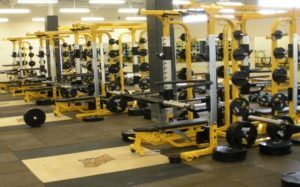 The KONG IQ strength & conditioning equipment is to be installed in Missouri Western State University’s $15.7 million facility called the Griffon Indoor Sports Complex. It contains a climate-controlled, 120-yard NFL regulation grass indoor field, with a locker room, weight room, training room, classrooms and office space. “Needless to say, Vivature is very proud to expand our services at Missouri Western. The statement (Director of Athletics) Josh Looney has made by choosing KONGiQ exemplifies his commitment to his student-athletes.” –Stated Vivature’s Executive Vice President and Inventor of KONG IQ, Lance Wilson.